This pendant portrays a gentle saint holding her hands in a gesture of prayer. A golden halo flows above her head, and golden stars shimmer throughout the pink and black background reminiscent of a stormy sky. The green and pink garment of the saint is highlighted with delicate strokes of gold. Her gaze is pointed downwards, as if observing the lives of those on earth and praying for their well-being. 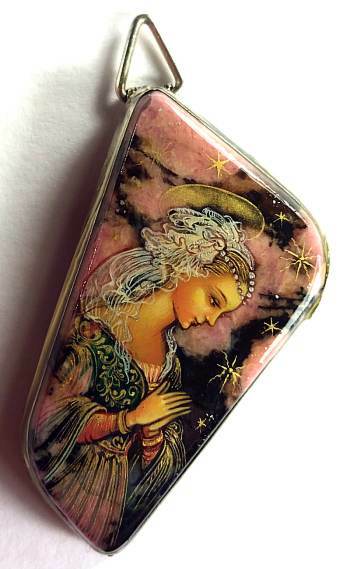 This lovely pendant is painted by a famous Russian lacquer artist from Palekh, Vera Smirnova, using traditional miniature lacquer painting techniques. The pendant is made from rhodonite and is nested in a German silver frame.